When terrorists attack, it is the lives of h elpless and innocent people that are tragically lost. Last month, during the terrorist attacks in Mumbai, the screen printing community lost one of its members, Mukesh Jadhav, an employee of Sky Screen (P) Ltd., Mumbai. He was a member of the Home Guards who lay down his life in the line of duty. SGAI held a condolence meeting where members recounted his bravery and presented contributions to his family to help them in their time of crisis. It was with a deep sense of sorrow and anguish that screen printing community reacted on lea rning about the unfortunate and untimely demise of one of its members during the tragic terrorist attacks that Mumbai recently witnessed. Mukesh Jadhav, a 23-year old employee of Sky Screen (P) Ltd. working as a dispatch clerk, was also a member of the Home Guards. During the terrorist attacks, he was on duty at Chhatrapati Shivaji Terminus (CST) where he bravely laid down his life. 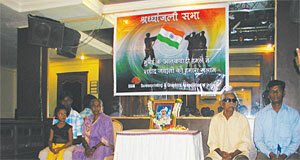 Screenprinting & Graphics Association of India (SGAI) gathered to pay tribute to his valiant efforts and dedication to duty by holding a memorial service on Friday, December 12, 2008 at Hotel Peninsula, Mumbai. The condolence meeting was held from 6.30 p.m. onwards to enable members of the screen printing community to take out some time from their busy schedules and commemorate the memory of Mukesh Jadhav. Akil Contractor, SGAI Committee Member also conveyed the sense of anguish felt by the screen printing community on the untimely demise of one of its members. On behalf of SGAI, a monetary contribution was made to Mukesh Jadhav’s family by President Anil Brahmbhatt. Sky Screen (P) Ltd., Varsha Transprint, Print Dynamic, Screen Print India, Tarun Print Tech and Screenways also presented contributions to help them in their time of crisis.